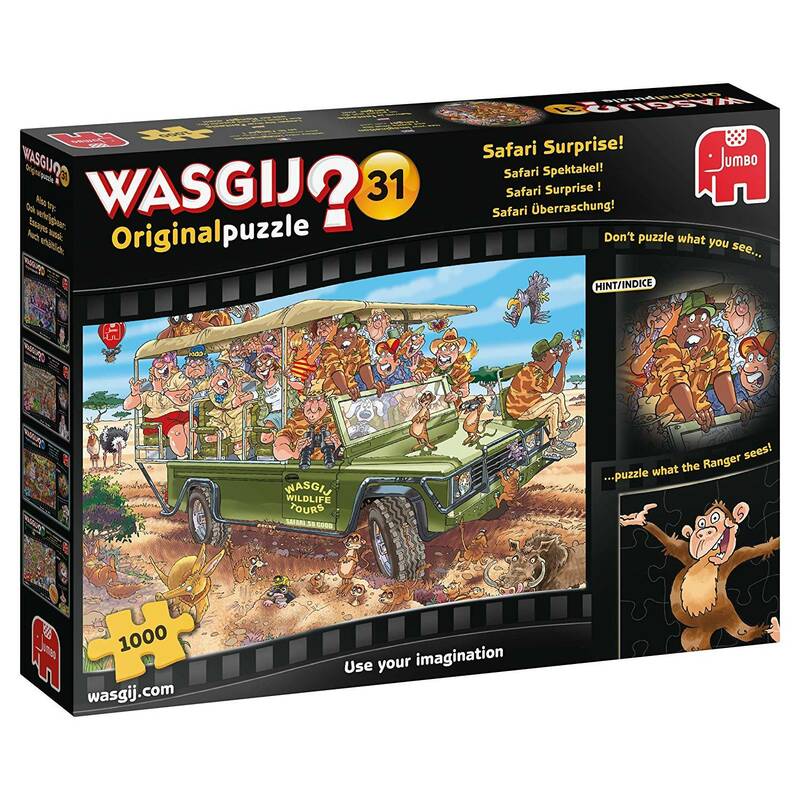 Wasgij original 31: safari surprise! Is the hilariously funny 1, 000 piece jigsaw puzzle that shows a wild safari tour. The image printed on the front of the box depicts the tour stopping to catch a glimpse of the wildlife around. However something has caught the eye of the people, causing them to double-take. What could be happening to get this surprised reaction from everyone? Try to imagine you are the tour guide and piece together what he can see. Wasgij original is the unique brainteaser puzzle concept where you have to work out the cause of the scene in the puzzle box image and discover why the characters in the illustration are looking so shocked? Can you use the clues to determine what has happened? Use your imagination and puzzle what everyone is looking so shocked about. Remember, only the puzzle holds the answer! The completed jigsaw puzzles measures 68 x 49 cm when completed and has been produced on a high quality cardboard using Jumbo’s precision die cutting techniques to ensure you receive only the highest quality of product and so that each jigsaw piece maintains its original shape for as long as possible.